OFWC, update the third -- now with pictures! This is a wide shot, as best I could, of the holes in the cloak. 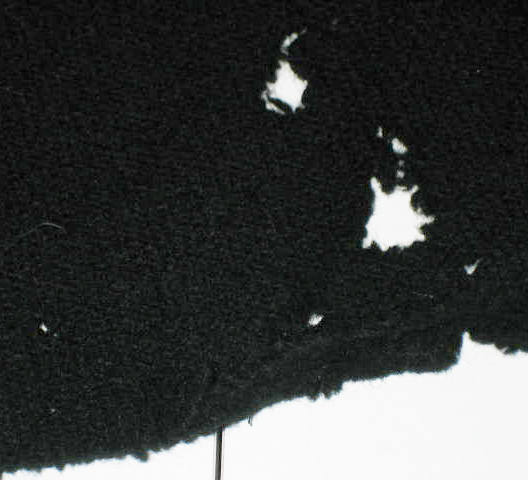 It's really hard to take pictures of a black cloak on a white cutting table with overhead lighting. This is a close-up, which actually turned out pretty good. Had I thought of it sooner, I'd have laid a quarter next to the holes for scale. My bad. I'll do that next time I do a progress report. 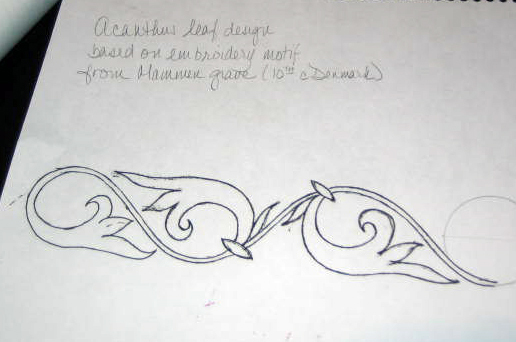 This is the acanthus design that I drew and traced onto the stabilizer. I played with the shapes of the leaves sometimes, just for something different to do. This is what it looks like, all drawn out on the stabilizer. I may end up cutting it apart to get it to curve along the hem, or at least making notches. I should get some scissors for paper. 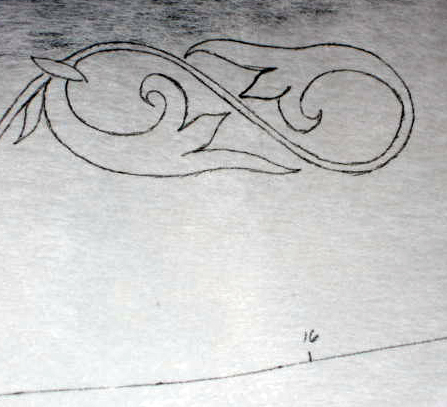 This is a close-up of the end of the design on the stabilizer. I love Zebra gel pens. 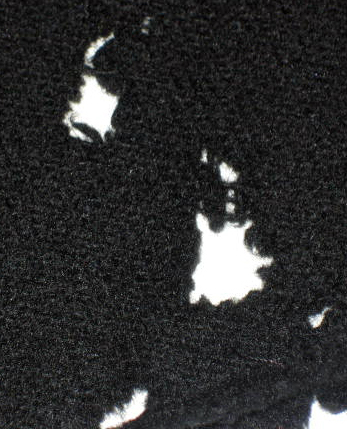 This is the fabric I'll be sewing on the bottom of the cloak. I've already worked blanket stitch along the bottom edge; next I'll do the top edge, and then pin it on the cloak and start getting the pattern arranged. This is the thread I'll be using, all very close in shade to the stuff I've been spinning. I just can't get enough spun in time to be useful,so I went to my LNS and found this. It's DMC Broder Medicis. 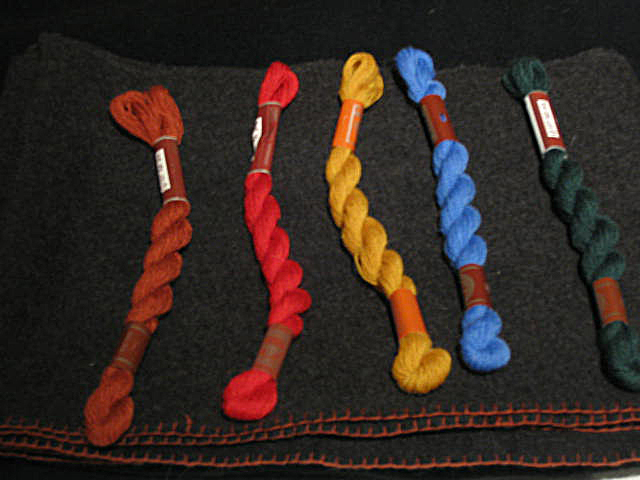 Color #s,L-R: 8104, 8103, 7484, 7899, and 8415 (which isn't as bluish as it looks here). I used the copper color to do the blanket stitch. 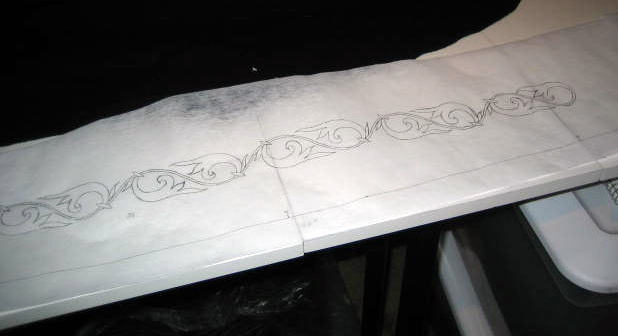 So that's where I am so far: design drawn and traced, fabric cut and stitched together*, and the edge treatment halfway done. I want to get the rest done soon so I can get the design arranged before we leave for Anthrocon in the wee sma's on Thursday. *I opted for the path of least resistance here. 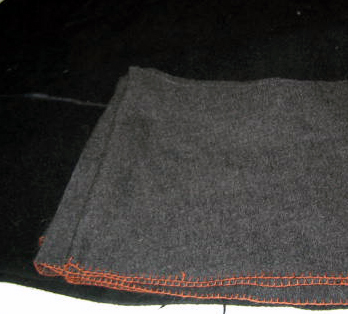 I folded the cloak in quarters, then I folded the fabric in quarters, put the cloak on top of the fabric, traced the lower edge, then marked a similar upper curve on the fabric, eight inches up, added some length at either end, and cut the pieces out. Then I did fake flat fell seams (pictures next time, hopefully), and started blanket stitching the edges. Easy peasy.